But the most intriguing recent question about our leaders’ meals arose the morning after the federal budget was handed down. Deputy Prime Minister Warren Truss gave a speech at the Conservative Breakfast Club, held in Brisbane City Hall. 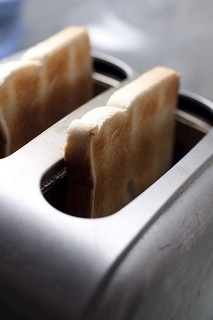 The Conservative Breakfast Club’s website explains that the club allows business people to hear from conservative politicians, and it features many full-colour and sepia-toned photos of yachts and skyscrapers, but none of breakfast. This made me wonder, is the breakfast also conservative? And what exactly would be on a conservative breakfast menu? Perhaps the guests dine on white toast with butter but definitely not margarine, and drink strong black tea without milk or sugar. Eggs would be served boiled, over easy or sunny side up, but not poached or scrambled. There might be Cornflakes – traditional Cornflakes of course, none of this Crunchy Nut nonsense – and Weet-Bix, but no muesli. 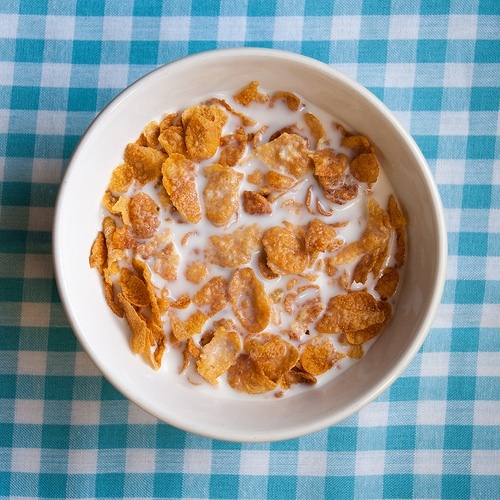 The cereals would be served with regular milk only, of course, not low-fat or skim or soy. Plain orange juice with no pulp would be appropriate, while juices with combinations like orange and mango or apple and blackberry would not. The next logical question that I have is whether there is a progressive breakfast club featuring progressive politicians, progressive business people and progressive breakfast? Everything would be organic, of course, and everyone there would sip lattes. I imagine the menu would feature free-range poached eggs with smashed avocado and goats’ fetta on sourdough and there would also be dukkah and red and brown quinoa involved somehow. Sweet choices probably include bircher muesli and ricotta pancakes. There would be gluten-free options and lactose-free options and fructose-free options. 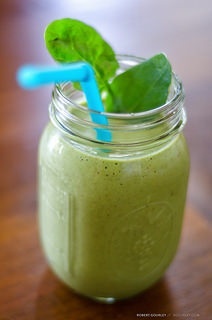 Oh, and kale smoothies served in mason jars. 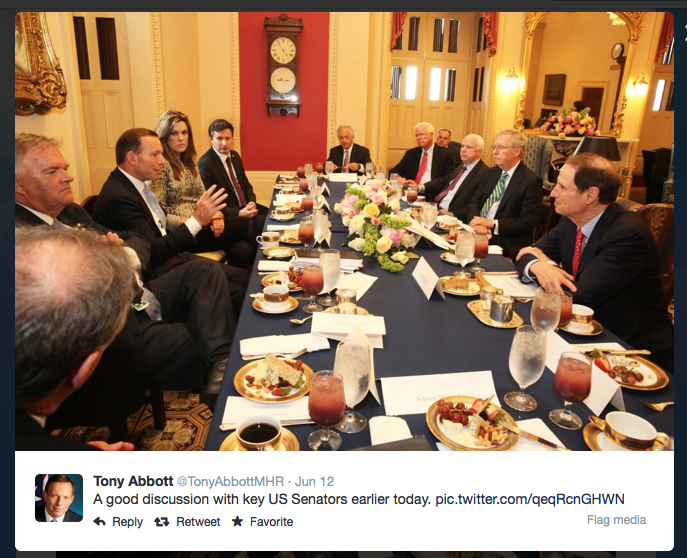 A few weeks after the budget I realised the photos of Prime Minister Tony Abbott’s trip to the US and Canada provide clues as to what might feature in a conservative breakfast. In a meeting with members of the US Senate, there appear to have been plates of cheese, strawberries, grapes, nuts and crackers, with tall glasses of iced water and an iced, two-toned red juice (I don’t think it’s wine because it looks like there’s ice and also the glasses are really full). There are also cups of coffee (tea?). All of this makes me wonder what time of the day this is – breakfast? Afternoon snack? After dinner? The clock in the background looks like it might say 5 to 5 but it’s quite difficult to see. The photo also features a lovely floral centrepiece on the table and a frowning Australian ambassador and former Labor leader Kim Beazley. 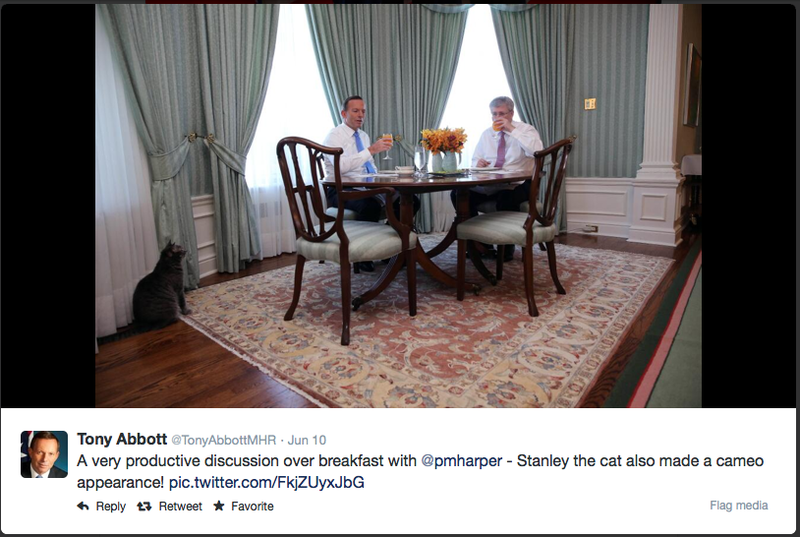 But my favourite photo from the prime ministerial trip is probably the one of Mr Abbott’s breakfast meeting with Canadian Prime Minister Stephen Harper. “A very productive discussion over breakfast,” he tweeted… except that there’s scarcely any breakfast to be seen. The leaders are sitting at a table drinking orange juice and there’s another tall glass of water next to two vases of flowers. But otherwise the table appears to feature only some empty crockery. Was breakfast finished? About to start? Did they pose for a quick photo in the well-furnished dining room and then duck out for McDonald’s? I’m sure McDonald’s in Canada serves very authentic maple syrup with its hotcakes. Or maybe they had poutine. Or both! It wouldn’t be surprising for a politician to have more than one breakfast in one morning… right Clive? What would you put on the menu for a conservative breakfast? Let me know in the comments.